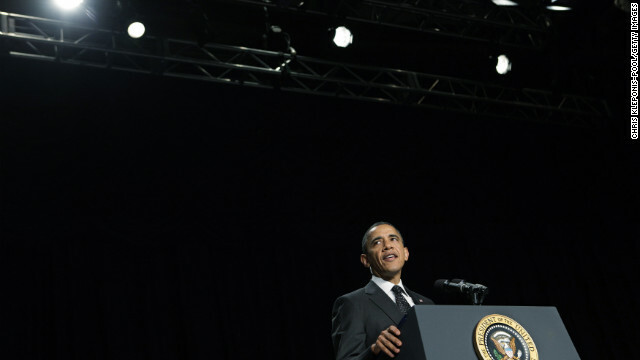 President Barack Obama speaks during the National Prayer Breakfast at the Washington Hilton Thursday. Washington (CNN) - Translation headsets squawked in four languages at the early morning breakfast in Washington, mixing in with the sounds of stirred coffee and clinking china in the immense ballroom at the Washington Hilton. The sound reverberated over the quiet of a momentary political cease-fire in Washington. For the 61st time, the president came to pray with the U.S. Senate and House prayer groups at the National Prayer Breakfast. It is an event that is equal parts prayer and politics, where members of both parties laud one another about a temporary political truce, lay down their partisan ammunition, and pause to pray together. Members of Congress mixed in across the ballroom with the 3,000 diplomats, dignitaries, clergy, veterans and many more from 140 countries who bought a ticket to join in the ecumenical prayer event. All told there were four short prayers, delivered by a senator, an admiral, a Cabinet secretary and an Olympic gold medalist, Gabrielle “the Flying Squirrel” Douglas. The remainder of the 90 minutes was filled with speeches, songs, coffee, mini-quiches, and bagels. Sen. Mark Pryor, R-Arkansas, greeted the crowd from the podium with a crisp, “Good morning sinners.” He then turned it over to fellow emcee Sen. Jeff Sessions, R-Alabama, who opened the event in prayer. Dr. Benjamin Carson, the director of pediatric neurosurgery for The Johns Hopkins Medical Institutions, delivered a keynote address that covered a broad range of topics. As he touched on taxes, deficit, education and health care, he received applause first from half of the crowd and then from the other half, in a way that was reminiscent of a State of the Union speech. He reminded the crowd of Washington power brokers that the American bald eagle needs both its left wing and its right wing to soar. President Barack Obama spoke at the annual breakfast for the fifth time since taking office, keeping the streak of presidential attendance of the event unbroken. The president began by announcing that his head of the White House Office of Faith-Based and Neighborhood Partnerships, Joshua DuBois, will be leaving his post on Friday. DuBois has been working with the president since his days in the Senate and has reached out to religious leaders across the spectrum on a range of issues. He has also been a key player in Obama’s personal faith life. “Joshua has been at my side at work and in prayer for years now,” the president said. “Every morning he sends me in an e-mail a daily meditation. A snippet of Scripture for me to reflect on, and it has meant the world to me. And despite my pleas, tomorrow will be his last day at the White House.” The president thanked DuBois, who was standing off stage to his right, and wished him well. The president used his speech, as he has in years past, to illuminate pieces of his own Christian faith and a faith in God and country. “We come together as a people of faith. We know faith is something that must be cultivated. Faith is not a possession. Faith is a process,” he said speaking from notes and without a teleprompter. The president spoke of the two men whose Bibles he used during his recent presidential inauguration ceremonies, President Abraham Lincoln and Martin Luther King Jr. He spoke of the trials they each faced and compared them, in part, to the current struggles facing the United States - the deficit, taxes and education - picking up on the major themes from Carson’s keynote. “In the midst of all these debates, we must keep that same humility that Dr. King and Lincoln and Washington and all our great leaders understood is at the core of true leadership,” the president said. “I do worry sometimes that as soon as we leave the prayer breakfast, everything we've been talking about the whole time at the prayer breakfast seems to be forgotten - on the same day of the prayer breakfast,” he said, drawing a laugh from the crowd as he turned toward Rep. Louis Gohmert, R-Texas, a loud critic of the president’s policies who was seated at the head table. “I mean, you'd like to think that the shelf life wasn't so short. But I go back to the Oval Office and I start watching the cable news networks and it's like we didn’t pray,” the president said as he then turned to Sen. Jeff Sessions, R-Alabama, who was seated next to him at the head table. “Sometimes I search Scripture to determine how best to balance life as a president and as a husband and as a father. I often search for Scripture to figure out how I can be a better man as well as a better president,” he said. The president added he thinks the country is united in fighting common struggles, “but I also believe that we are united in the knowledge of a redeeming savior, whose grace is sufficient for the multitude of our sins, and whose love is never failing. After the conclusion of the president’s remarks Italian opera singer Andrea Bocelli sang Ave Maria to close the event. As he finished singing he motioned that he wanted to add a few words. “It’s tough to pray with someone and then go on the Senate floor and beat the tar out of someone. It’s tough, but not impossible,” he said with a wide grin. And with that he and the other members of Congress headed back to Capitol Hill and the president returned to the White House. Sorry, not going to Casablanca anytime soon. . .